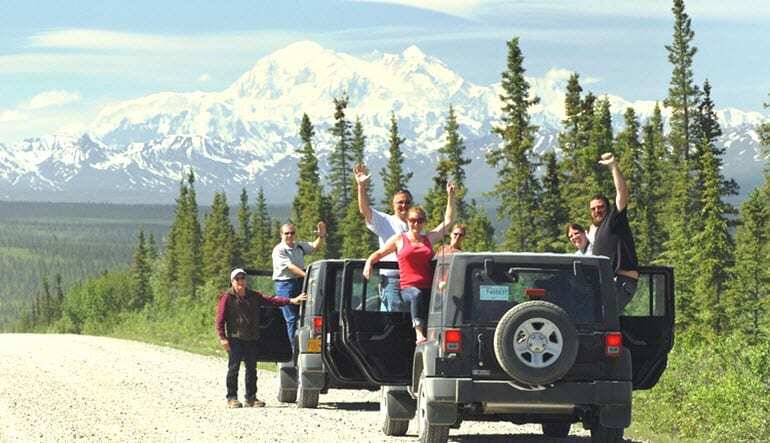 This Denali jeep tour puts you in the driver’s seat for part of the journey. This isn’t a highway accessible to most, so consider yourself one of the lucky few. The Denali highway. This graveled stretch of America was voted by National Geographic Travel the #2 “Drive of a Lifetime.” Glaciers, mountains stretching to the heavens, vistas so beautiful you’ll pinch yourself—the views here are other-worldly. Now’s your chance to see what all the fuss is about. For part of the journey you get to hop in a 4x4 Jeep and set off on a 100-plus mile journey you’ll never forget. This Denali jeep tour puts you in the driver’s seat. You’ll follow a guide who communicates to you via CB radio, ensuring you don’t miss a thing. This isn’t a highway accessible to most, so consider yourself one of the few lucky souls to experience a trip so beautiful. 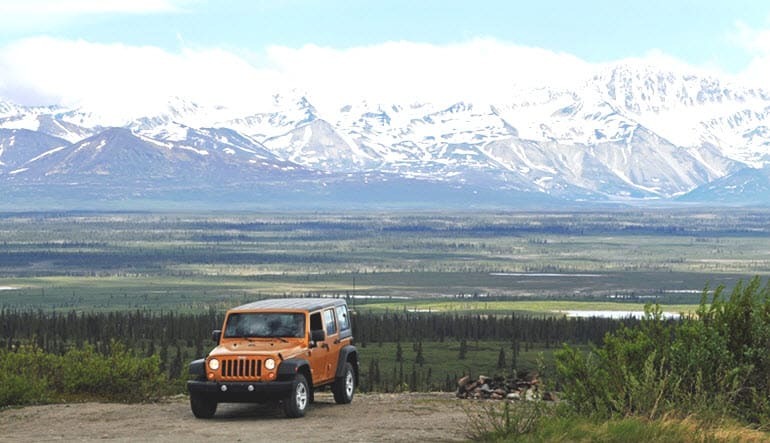 Take a 4-hour Denali Highway Jeep tour. Ride a brand new 4-door 4x4 Jeep equipped with a CB radio. Follow your guide across the 135-mile road of dirt and gravel. Be amazed by the mountainous views—Denali, the Amphitheater Mountains, the Clearwater Mountains and more! See the stunning Nenana and West Fork glaciers! 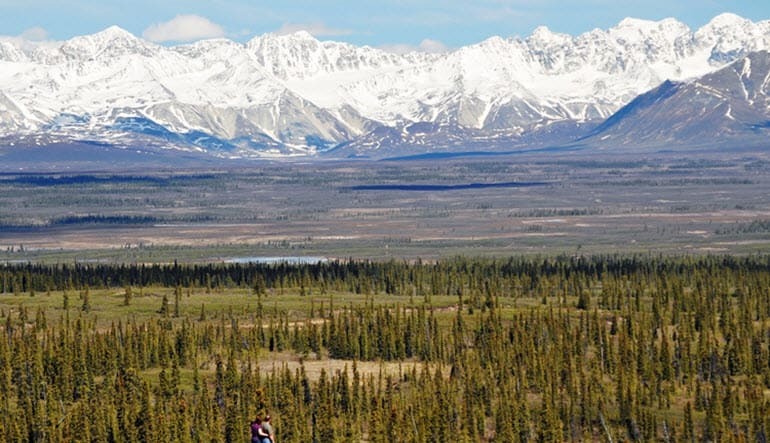 Enter the Nenana River valley and be surrounded by boreal beauty. Pull over to capture photos of the landscapes and abundant wildlife. Receive transportation from and back to Denali area lodging. This is by no means a speedy adventure. 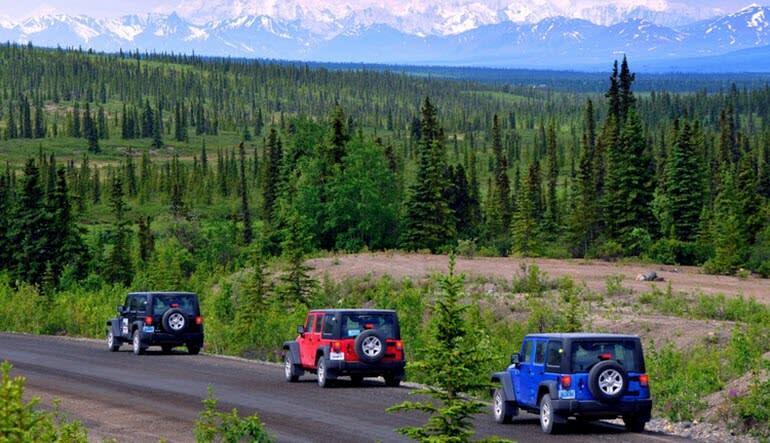 Here, you’re encouraged to just slow down and take it all in one mile at a time—book your Alaska wilderness jeep tour now! Shuttle pickup is available from multiple locations in Denali. Upon booking you will receive a list of locations and are required to call to reserve shuttle transportation.